Foothill's Andres Meza scrimmages with teammates at practice on Tuesday. Coach Ty Rose splits team up for scrimmage drills during a Tuesday practice at Foothiall. The Trojans have made the Central Section playoffs four of the five years Rose has been in charge of the program. Jose Medina works on conditioning with teammates during a recent Foothill boys soccer practice. Juan Ojeda scrimmages with teammates during a recent Foothill boys soccer practice. Football boys soccer coach Ty Rose works with his team during a recent practice at the school field. Foothill soccer player Jose Medina scrimmages with teammates during a recent practice at the school field. Simply put, the Foothill boys soccer team grew tired of losing. And they’ve used that as their bedrock of motivation for the 2019 season. A year after a 6-15-2 campaign, the Trojans have been a surprise story this winter. The team held a 14-0-4 mark after beating Highland 3-0 on Friday and found itself in rarified air this week — slotted No. 1 atop the MaxPreps.com Central Section Division IV rankings. The Trojans were exceedingly young in 2018, Rose said. And while they were competitive in some games, they didn’t have much success to show for it in the win column. They also had plenty of talent, however — the team’s core group of players won a Southeast Yosemite League junior varsity title in 2016-17 — and went into the offseason with a renewed focus. Rose said players were committed in the weight room and in their fitness regimens. The simple fact is that the Trojans haven’t lost yet this season. They’re still a young team — nine juniors make up the roster, a group that includes key pieces such as Jose Medina (defender), Andres Meza (midfielder) and Jorgi Cruz (midfielder). 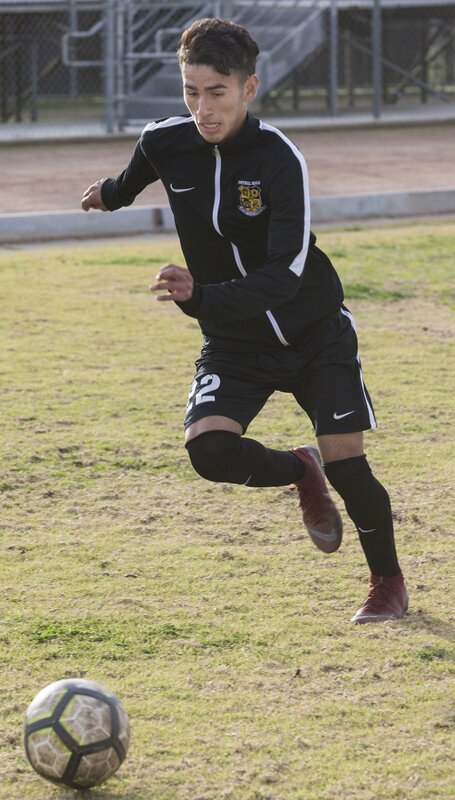 Ojeda, a senior, leads the team with 12 goals and 12 assists. Through it all, Foothill looks to play a fast, aggressive, competitive style. The Trojans are a hungry team, with all 11 players taking the field with the same mindset. Typically, with that approach, a team can be tough to beat. Medina said one asset the Trojans have is they’re all homegrown players with virtually no transfers on the roster. They’ve risen the high school ranks together, as a collective unit. The Trojans will look to continue building in Southeast Yosemite League play. Defending Central Section Division IV champion Mira Monte resides in the SEYL, along with an established South program. Rose also said teams such as Highland, East and North should not be taken for granted. In other words, it’s a challenging league. Foothill has SEYL wins thus far over South, North and Highland. While the Trojans been respectable in recent years — they’ve qualified for the Central Section playoffs four of the five years Rose has been in charge of the program — the team has yet to win a postseason game during that span. They hope 2019 is the year that streak comes to an end. Soccer is pretty much everything to Sabrina Weinman. And it shows in the results.